Langston University welcomes acting president and LU alumnus, Dr. Henry Ponder. Ponder will act as president during President Haysbert's leave. A former president of three institutions of higher learning, Dr. Henry Ponder, will take over as acting president at his alma mater after outgoing LU President JoAnn W. Haysbert named him as her temporary successor. Haysbert recently announced her intention to use accrued leave time instead of remaining at her post through the end of the fall semester. The board of regents for the Oklahoma Agricultural and Mechanical Colleges approved Haysbert’s leave earlier this week. Ponder served in a variety of positions at six different HBCU’s, including tenure as president at Benedict College, Fisk University and Talladega College. After retiring to Hilton Head, S.C., Ponder found his way back to Langston when he was asked to return to work at the university as an endowed chair and professor of educational and institutional advancement. After moving around the U.S. working as an educator, Ponder returned to Oklahoma nearly 60 years after he had received his degree in agriculture in 1951. Ponder was hired to serve as the Lillian Hemmitt Endowed Chair and professor of educational and institutional advancement. Ponder brings a wealth of higher education experience to Langston, having served as a professor, department head, division chair, school dean, vice president and president. 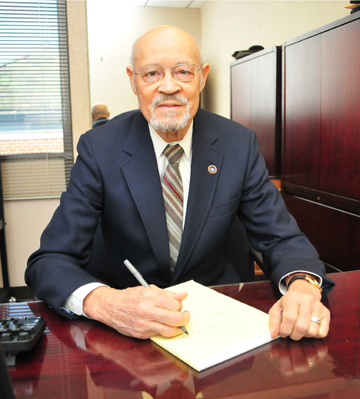 His initial role with Langston allowed him to share his knowledge with LU students, faculty and staff.